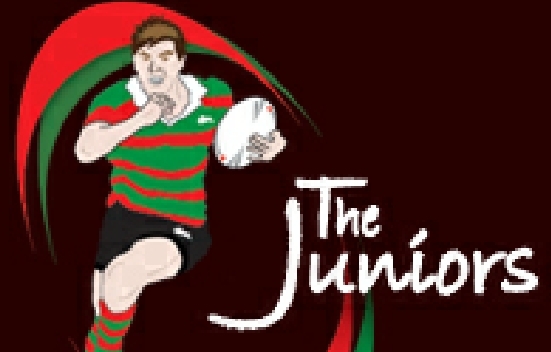 What has the South Sydney Junior Rugby League Club to do with the TCP Code? Telcoinabox CEO Damian Kay last week denounced the TCP Code as treating the public like idiots and imposing an unnecessary compliance burden on smaller resellers. He’s wrong on the first count (the code does vital work in protecting consumers against entrenched, often deliberate, poor practices of many telcos) but largely correct on the second. There are at least two reasons why ACMA promoted regulation that, in the case of too many telcos, is heavy handed, too burdensome and unwarranted. The TCP Code applies to carriage service providers. Fine. But who is that? How many are there? What do they do? The truth is that nobody knows, even roughly, how the broader ‘carriage service provider’ industry is made up. Sure, we can account for 90%+ of customers, because Telstra, Optus, Vodafone and a few others collectively service them. But no way can we account for 90% of carriage service providers. ACMA doesn’t really know whether there are 600, 800, 1,000 or 1,200 of them, or more. Nobody really knows. Of course, many CSPs are required to be members of the TIO scheme, and the TIO’s membership list is the closest thing we have to an industry register. But there are two problems with that. One: some companies register with the TIO when they strictly don’t need to. They are unsure whether they are obliged to join, so they sign up just in case. Two: there’s no mechanism for keeping the TIO records up to date. If a computer shop that used to sell DSL services to its small business customers stops doing that, it will probably forget to notify the TIO that it is no longer a CSP, and remain on the list forever after. No doubt there is some good historical reason why the South Sydney Junior Rugby League Club is a TIO member, but it seems that nobody today knows what that might be. At best the TIO list is a very rough approximation of the CSP industry in Australia. And where it is most unreliable is in the area of the ‘smaller resellers’ that Damian Kay referred to. 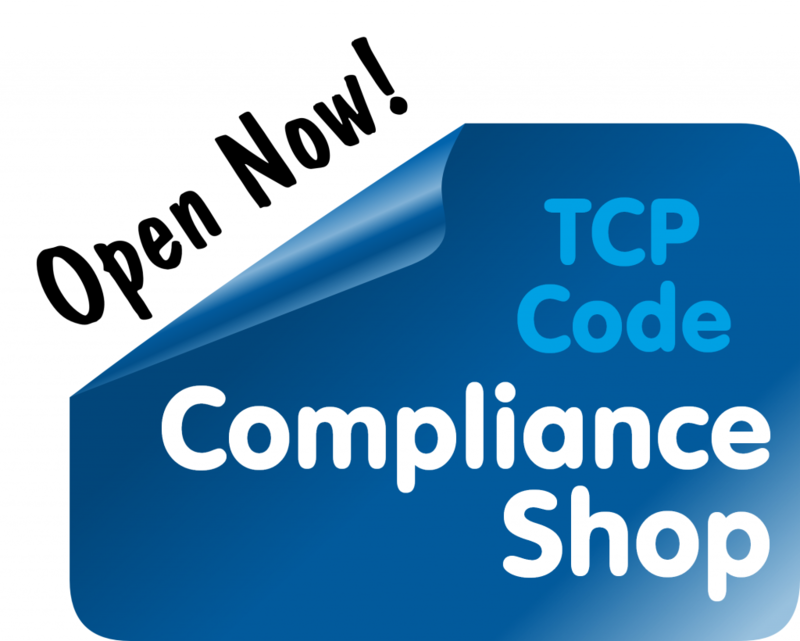 ACMA promoted the TCP Code without having an adequate picture of who it was regulating. That’s a recipe for over-regulation. “ACMA promoted the TCP Code” ?? Didn’t Communications Alliance deliver the Code? Yes, under driving pressure from ACMA. ACMA didn’t author the code, and it might even disapprove of much of the code’s drafting detail. But it insisted there be a code, drove key aspects of it, and agreed to register and enforce it. The TCP Code may not be ACMA’s natural child but it certainly adopted it. Now, it’s ACMA’s baby. 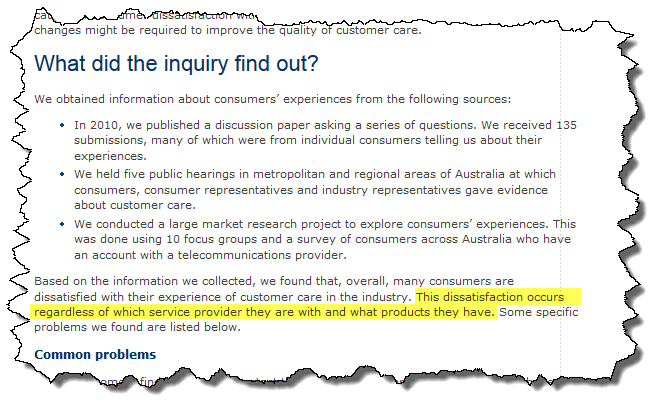 Correctly, ACMA considered that there was overwhelming evidence of a high level of telco customer dissatisfaction. Who doesn’t know several people who tell gruesome stories of mistreatment at the hands of a phone or internet company? How many of us have our own war stories? 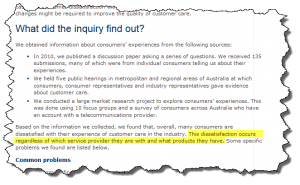 ACMA’s Reconnecting the Customer enquiry and report amply documented the pain that many telco customers suffer. This is an extraordinary statement when you don’t really know how many operators are in the industry, or (in any detail) what many of them do or how many customers they have … and when you do know that 500 or more telcos account for a miniscule fraction of all TIO complaints. It may be a fair statement regarding Telstra, Optus, Vodafone iiNet, TPG and a hundred others, or even two hundred others. But when you’re demanding a code that will regulate hundreds, maybe 1200+, businesses, you need good evidence before you can make the statement that customers were substantially dissatisfied ‘regardless of which service provider they are with and what products they have.’ That evidence simply wasn’t there. It was there regarding the telcos that came to ACMA’s attention in the course of Reconnecting the Customer but an enquiry like that is a magnet for disgruntled customers and their advocates, that may tell you very little about Damian Kay’s ‘smaller resellers’. Now that the TCP Code is in force, we’re finding out that there are CSPs out there who haven’t had a TIO complaint in years of operation. CSPs with just a few hundred customers, all happy. A CSP who provides a free wireless service for lucky visitors to a country town as a public service. CSPs whose customers are 95% big business and 5% small business that they care for just as well. CSPs that only provide no-contract teleconferencing facilities to SMEs who don’t have to use them again if they aren’t happy. There are local computer stores that loyally provide a few DSL services to a loyal customer base. Family run telcos that would rather lose money than let down their customers. Sure, all these businesses are small. Sure, they account for a modest percentage of total telco customers. But there are hundreds of them, and all of them have been subjected to the hundred pages of TCP Code rules. What were the chances that customers of these hundreds of telcos would have been represented in the ten focus groups that ACMA convened? Or that any of their customers appeared at the five public hearings? Or made any of the 135 submissions? It seems that the customers of these telcos are pretty happy (or at least, when they are unhappy, they can get satisfaction by dealing with their service provider instead of needing to resort to the TIO). Why would they contact a government enquiry, even if they knew about it? What evidence is there that customers of teleconferencing service providers suffer just like mobile phone users? Or that they suffer at all? Or that the hundreds of TIO members who received zero or just a couple of complaints last year are really just as bad as DodgyTel? It’s been proclaimed a virtue of the TCP Code that it applies to one and all, but good regulation prides itself on going no further than is warranted. Or at least, significantly fewer requirements should apply to smaller telcos. It is nearly impossible for a small telco to comply with the TCP Code and stay in business. These businesses have negligible customer issues, and hundreds of them taken together account for 0.3% of all TIO complaints. At their end of the market, if they weren’t keeping their customers happy they’d be out of business in no time. And yet they are subject to pretty much the same hundred pages of rules as Dodo and TPG. The RIS prepared by the Commonwealth Department of Finance and Deregulation inadvertently demonstrates the point we’re making. While it recognises that there is a large number of small telcos, its analysis of the cost of the code entirely disregards their position. The code will cost $52m in aggregate for the industry to implement, it estimates, and $102m a year to maintain, but there’s no attempt to assess the cost burden on a typical small telco. Is it $20,000 a year or $50,000 or $100,000? The financial impact of the code on the overwhelming majority of the industry (by number of operators) wasn’t canvassed. Nor was the need for that burden (whatever it is) to be cast on a rural telco with 2,500 happy customers, or a teleconferencing service that’s never seen a TIO complaint. Apparently ‘the customers’ are unhappy with ‘the industry’ so ‘the industry’ needs to be regulated with a single, mighty baseball bat. The practices and standards of many telcos, including the largest, demanded action. The TCP Code or some other regulation was necessary. But the process should have included a proper assessment and analysis of the real size and composition of ‘the industry’. The Code should apply with much more granularity, and perhaps not apply at all to many telcos, unless they trigger certain customer dissatisfaction rules. There should have been provision – as there is under the TIO Scheme – for low risk telcos to apply to be exempted. In a nation that prides itself on encouraging small business and telco competition, there shouldn’t be hundreds of telcos subjected to a hundred pages of rules, when between them they don’t account for a hundredth of demonstrable telco dissatisfaction. Footnote: Is it only about TIO complaints? The Telecommunications Act doesn’t precondition industry codes or standards on TIO complaints. ACMA is entitled, in an appropriate case, to regulate on matters that aren’t reflected in TIO numbers at all. But in the case of the TCP Code, demonstrated consumer dissatisfaction is the raison d’etre for the regulation, and the regulator’s primary index in that regard is the TIO’s figures. Whether that’s a valid way to measure it is hotly debated by some, but it’s nonetheless a primary factor in ACMA’s policy and enforcement approaches. This entry was posted in Backgrounders, Criticising the Code. Bookmark the permalink.